As with a front band pattern, once you have your basic pattern with a front facing, there are innumerable things you can do with it. Here’s the link to the starting-point post on making a pattern for a combined facing to front edge and neckline. Basically, the seam along the front-and-neckline edge makes it easy to sandwich extra style elements between main garment and facing. – between main body and facing, such as button loops, tabs. – after the facing is added, such as buttons, snaps. See this Craftsy/Bluprint class for ideas for special fastenings (not free). Items to insert into the edge seam joining facing and main body include : frills, flounces, piping, beading, lace trims, broderie anglaise, fringing, zipper teeth, braid, pom-poms, ric-rac, prairie points. . .
Add these before sewing the facing unit to the main body unit. Baste frills, button loops, trims, etc. to edge of main fabric – raw edges matching and right sides together. Trims point inwards from the edge while they’re being sewn on – one of those inside-out-and-back-to-front sewing techniques which doesn’t look right until it’s finished. If you add bulky trim such as piping in the edge, it’s easiest to use a zipper foot when sewing facing unit and main body unit together. Another option for a faced decorative edge (not an add-in) is to change the edge shape – to curves, zigzags, scallops. Change main body and facing edges to match. Or attach the facing so it is outside rather than inside – though this does need some extra sewing techniques. Like trims, collars can be sandwiched between main body and facing. Use the collar piece from another pattern. You do need to check that neckline and collar stitching line lengths match up. Notes in this post about how to measure the neckline stitching line, and change the length of a collar pattern. 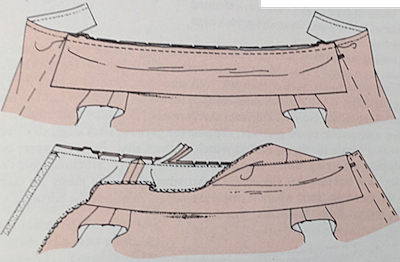 – stand collar : place outside of collar to right side of body, turn up once sewn. – other collars : place underside of collar to right side of body. Jules Fallon from Sew Me Something patterns demonstrates sewing collar and facing to a pyjama jacket. This includes a collar with sharp corner – Sewing Quarter, 11 Sept 18, time 2.22 – 2.55 (drag time line blob along to time wanted). More tips from her, especially about sewing curves and lighter fabrics – Sewing Quarter, 15 Nov 18, time 0.32 – 0.53. This is the easiest method for adding a collar to a casual blouse/shirt/jacket. Much the same as making pjs – just different fabric ! And this is also the collar sewing technique used in many blazer and other tailored/lined jacket patterns. There are yet more collar shapes you can add into a faced neckline which doesn’t have a front opening. And use a similar method on a faced armhole, to add a cap sleeve or trims. More comments on other collars in the post on add-ons to a button band front opening. And have a lovely holiday period enjoying yourself in whatever way best suits you ! This entry was posted on December 6, 2018 at 12:30 pm and is filed under pattern making for clothes. You can subscribe via RSS 2.0 feed to this post's comments. Both comments and pings are currently closed.